For those new to the world of Fair Business Loans we wanted to highlight one of our great achievements from last year! 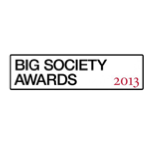 In 2010 Prime Minister David Cameron set up The Big Society Awards. These awards were created to recognise and celebrate individuals, groups or organisations doing exceptional work in their community, going above and beyond to make things better for others. Improving lives and society through innovation, collaboration and new partnerships. Fair Finance - of which Fair Business Loans is part - was proud to receive a Big Society Award last year! Accepting the award, Faisel Rahman, CEO of Fair Finance, said “The growth of the high cost credit market has shown how hard it is becoming for many people to access mainstream finance. Our ambition is to work with those not able to access traditional financing products, in many cases alongside banks, to help them achieve their business aspirations and avoid these high cost lenders. At Fair Business Loans we are pleased and proud to be associated with the whole ethos of Big Society. We are determined to lead the way in providing small business funding on a fair basis. When we have helped to put the loan sharks and predatory lenders out of business, then we will know we have been successful! If you would like to talk through in more detail how we might be able to help with funding for your small business contact Fair Business Loans now!